alright I'm definitely missing something here. How do you apply the silver to the whole body? Or just to an arm? Uh, wow Bejaymac, you nailed the two major reasons on the head! I'm so grateful to you for explaining things so well. Making grafting figures that exactly match V4 UVs (Genesis's default) over seams was extremely difficult. There are so few UV mapping tools that will allow you to snap UV vertices from one object to another. Silo, which I use, does a good job but it also has a bug that disintegrates UVs over time (and there is no hope of the program ever being updated). So many times I found my work was lost even though I had saved it and had to do the UVs all over again. It's a fate too tedious to wish on my worst enemy. Have a look at modo - that should do what you need, if you place the snap-to geometry in a background layer. Thanks, Richard. I'm definitely looking at Modo, but at $1200 I've got to get a good idea of the learning curve and other features that I might use over other software I have. $1200 would be too much for me to justify if it were just for UV snapping. 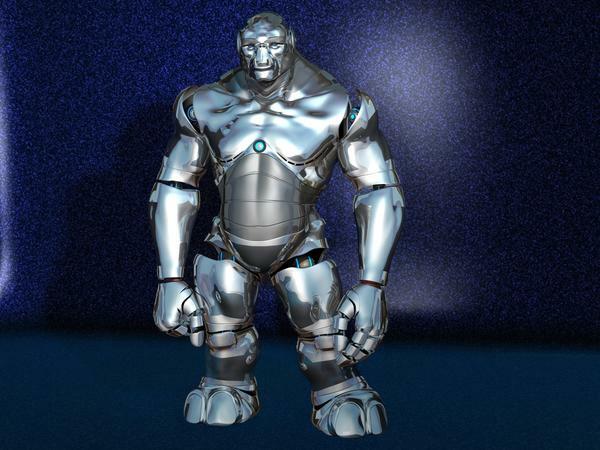 To apply silver (chrome) to the whole body: Mechanical figures load with the chrome materials, so you just need to apply a material preset to Genesis. To do that, make sure that Genesis is selected in the Scene tab. Then, in the Content Library tab, navigate to People>Genesis>Materials>Bot Genesis and double left click BotGen_BaseMat (if you want chrome with no makeup) or BotGen_FemMat (if you want chrome with pretty, girly pink make-up). As for the rest of the material presets, there is a group for applying a very basic metallic material (with no reflections) labeled "Quik" in the titles and a group of presets that do chrome with real ray-traced reflections (takes longer to render) labeled "Trace". Each preset has a thumbnail and name which should then make it clear what to apply it to. So for instance, if you want to apply material changes to the left mechanical hand figure, select the figure in the Scene tab, then double left click the material preset in the Content Library called BotGen_Quik_LHand (for quick metal) or BotGen_Trace_LHand (for ray-traced metal). 1. In the Scene tab, select the Figures that you want to apply materials to (hold down Ctrl to select multiple. You may need to expand Genesis to see Mechanical figures if they are parented to it). 2. In the Surfaces tab, select the surfaces in each figure that you want to apply the materials to (hold down Ctrl to select multiple). 3. In the Content Library tab, hold down Ctrl while double left clicking on the icon for the material you want to apply. 4. In the Material Preset Load Options dialog, choose “Selected” from the Surfaces dropdown then click the Accept button. The limitation with partial mats here is that we have to work with the existing material zones that Genesis (V4 UVs, which are the default) has. So you may imagine different points where skin meets flesh that the material zones don't support. I'm working on a texture set that will provide more logical material intersections. However that scenario will likely support only the materials made specifically for this purpose because of the limitation of existing material zones. Images will make this clearer, if it doesn't make sense right now. So hang tight. I'll post a link in here once I've got pictures to show. Is there any way to get parts of the torso armor to simply disappear without pasting a V4 texture on top of it? I wanted to try something with the torso segment where the only visible part was the spine, and not the parts that wrap around the neck and abdomen. However, because the custom shader doesn't have an opacity strength slider, there doesn't seem to be any way to get rid of it. Since I was trying it on an M4 character, pasting textures over it wouldn't work. Different options are present or not depending on which surfaces you select, so figuring out what one could do is very confusing anyway. Tried using the Value sliders, and they didn't seem to help, and after that, I didn't have a clue. Also, if you don't want the torso or full-body bot, is there any way to get a clean edge on the hip joints? They're very jagged. I've tried pasting V4 textures into the SkinHip and skin sections, but that didn't work. Have you looked at Headus UV Layout? The Pro version runs $300 and they offer a demo to try it out. I would like to know what UV Maps this supports. I am trying to get Hitomi maps to work and I just can't. at least not properly. I am trying to use the Robo Geisha set. Only V4 UVs are supported. Well here is something I've been working on. hope you like it. I have come across a few bumps in the road while working with the genesis bot it nothing I could not get past.I love it. Vwrangler, I don't want to leave you hanging, so I'll try to answer your questions as best I can. However, I have a sense about some of your questions that makes me think my answers won't necessarily take you exactly where you want to go. Understanding all the complexities and limitations of the technology in DAZ Studio (or any 3D app) can be a little daunting. In my own work, I try to figure out the shortest route to creating what my mind is imagining. If you're not working on animation, it's often a lot easier to get what you want by doing two renders (one of each thing you want to combine) and then use Photoshop (or other image editor) to combine the renders with each render as separate layers. If you insist on being a 3D purist, your in for a very long bumpy ride. Hiding things -- On the Surfaces tab, select the surface you want to hide. You can also use the Surface Selection Tool and click on the area of the figure, if you're not sure which surface is the right one. Then click on Opacity Color and change it from white to black. That will make the polygons that share that surface disappear. However, that will produce a hole in the figure, so like I said before, I'm not sure that is what you want here. The technology limitation here is that the bot figures are geografted, which means that they replace the geometry of Genesis rather than just cover over it like clothing. Looking at the example you gave of wanting to use just the spine part of the bot torso figure (and not the neck, etc. ), I think the easiest way would be to do two renders: one of Genesis and one or the robot, then layer in Photoshop. Put the Genesis render on top and erase wherever you want the robot to show through. It may get trickier (with more layers) depending on what you're trying to do, but probably way easier than breaking up my model in a modeler and then re-rigging, etc. in DAZ studio (which is about the only other way to use just part of the torso figure the way I think you intend. 1. In the Scene tab, select the Figures that you want to apply materials to (you may need to expand Genesis to see Mechanical figures that are parented to it). 2. 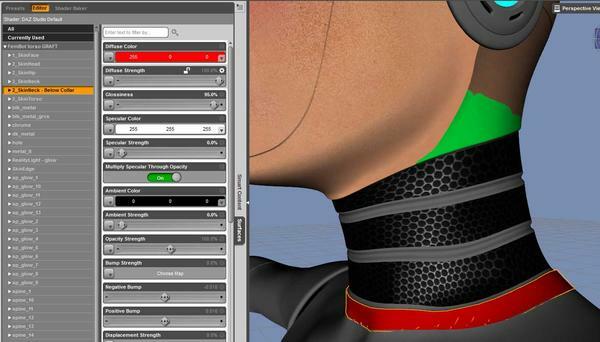 In the Surfaces tab, select the surfaces in each figure that you want to apply the materials to. 4. In the Material Preset Load Options dialog, choose “Selected” fron the Surfaces dropdown then click the Accept button. Hopefully I've answered your questions, but let me know. Also, bit more is here: http://www.daz3d.com/forums/discussion/16305/ Good Luck! First, the main alternate UV I'd like to see supported is V5. I'm sure others will have their preferences, but V5's UV map seems to be the most supported (by third-party content creators) of the (non-generation 4) alternate UVs available for Genesis at this time. Second, I had to re-assign some of the faces in the torso geograft to get a clean break between bot torso and human head. The issue is that the SkinNeck zone in the torso exists both above and below the neck collar. Above the collar, you want to use a human skin, but below the collar, you want bot metal. I ended up selecting the faces below the collar and making them into a new material zone. Given that I think "bot with human head" is something that might be kind of popular, this might be something to consider integrating into the product for a future update. I've attached a screenshot to show what I mean. To highlight the surfaces in question, I've set them to bright solid colours. The green area is the original SkinNeck, and the red area is the new SkinNeck - Below Collar zone that I remapped in the Polygon Group Editor. Thanks for the feedback. Yep, I definitely understand your points and will keep them in mind. Specifically I am planning a texture set that will include more versatile transitions between metal and flesh. This will likely utilize dual material surface shaders so that transitions are not limited by imperfect polygon loops. I may also try to provide some ethnicity options in that texture set as well. Thanks for such a very detailed and helpful answer. And no, I'm not any sort of purist, though my postwork skills are kind of ... interestingly terrible when it comes to fine work. The technology limitation here is that the bot figures are geografted, which means that they replace the geometry of Genesis rather than just cover over it like clothing. I wasn't sure about where the balance between geograft and Genesis and texture and how they interacted was, so this was a good thing to know. It's clear that the core part of the joints, where you can see through, are geografts, but since the items install into People/Genesis/Clothing, I thought something like the torso section, with no visible interior sections, might just wrap around Genesis rather than replacing that section of the figure completely. Thank you for letting me know that isn't the case; I have a better idea how to use it now. And thanks for answering the question about the texture replacement again; I didn't realize that it would just be the same solution as the chrome replacement. I thought that was just particular to the shaders designed to go with the figure. EDIT: So I just had to see what it would look like with the opacity flipped to black on some sections. It's kind of interesting, in a surreal sort of way. If someone wanted to do a "building the bot" type render, it could make for a sort of starting point. And the other solution worked perfectly on a V4 textured character to make a clean edge. Thanks again! Please keep in mind that tricks with 3Delight shaders will probably be useless in other rendering engines. I do all my rendering with LuxRender, for example. LuxRender is more than capable of using layered materials. True, but most users won't have a clue how to convert a Shader Mixer network into the required mix materials for Lux. Cwichura, I'm going to provide Poser materials, but what do you see as being the remedy for Lux users? If you're asking me to provide shaders for Lux, then what about Bryce, Carrara, Vue, etc. Like I said before, there are limits to what the technology will allow and to what will be worthwhile to provide additional support for. I'd like to help out beginners if I can, but once you leave the native app, it's fairly common in 3D community recognition that you will need to modify your shaders to suit your rendering engine (and like you said that's fairly advanced). I think the most obvious workaround would be for users of other render engines or apps to apply basic shaders like the ones I have already included before leaving DS. So I can at least see where this could be another helpful note in the Readme or a PDF tutorial. But I don't know if it will be practical for me to provide support for renderers beyond 3delight and Firefly (though I'm still open to listening to suggestions at least). I wasn't expecting a conversion of shaders. But to the extent that borders can be done with things like separate material zones, rather than blending tricks in a shader, that will make it a lot easier for folks using other rendering engines to use. That's all I was trying to point out. Very good. I get you. It's just that in the case of material zones, you are a slave to the poly loops. I could create a separate set of models, with different material zones so that you have the option of being all flesh or all metal or whatever (like what currently exists in the product) and then another set with logical breaks in material zones for the flesh meets metal effect. That's going to create an unpredictable edge when different morphs are applied but maybe that would look OK. I'd have to try it and see if it looked good enough. Creatively though, I was thinking how cool it would be if metal faded into flesh like circuits becoming veins and then falling beneath the skins surface. Another idea I had would be other transition elements like subtle bolts or clamps or just a realistic but clean meeting of the two edges with displacement. In any case I think your point is valid and worth considering. Thank you! Just a small plug... I posted a close-up of BotGenesis rendered in LuxRender over on deviantART, where the humanoid head on bot body that I was pointing out with the earlier material zones screenshot can be seen. The full scene the close-up is taken from is Cryo Cargo Inspection. Can you share some tips on how you made her look like that in reality? My chrome reflections and etc. are not working at all with bot genesis in Reality, the color is all dull (almost black, like realities youtube video on "no more black eyes". I've been trying for hours to get her to look right. My render is of her backside, normal looking girl but showing off the cyborg spine and a hand. I forgot to mention that everything looks great with the normal DS rendering engine, just not with Reality 2.5. I see you started a thread about this over in the Reality forums with sample images of what you're getting. (http://forum.runtimedna.com/showthread.php?78157-Bot-Genesis) I will answer over there once I get into work and can pull up the scene file to verify settings I used. Thanks cwichura! I'm sub'd on both for email notifications. :-) I wasn't sure which forum was the best place to post. Someone have this issue with the new beta version of Daz? Yeah, but I think it still renders OK. I would put a ticket in though. Ouch :( doesn't look as bad as Carrara 8.5 though. you're right, it renders ok, the issue is only on viewport. Select the figure or model that you want to fix. Activate the Polygon Group Editor Tool and use one of many selection methods to select the polys that you want to effect. In the case of my elbow caps, you will want to hide Genesis (click eye to the left of Genesis in the Scene tab) so you can more easily see the bot elbow parts. Next select the elbow figure in the Scene tab, then right click in the viewport and select Polygon Selection > Select > Surfaces > hole. Now the problem polys should all be selected. Now right click in the viewport again and navigate to Polygon Editing > Reverse Winding Order to apply the fix. No idea why they call it that; 3D Modelers are more familiar with the term "Reverse Normals" as it is called in most 3D apps I know of. With the right elbow figure still selected in the Scene tab, choose File > Save As > Support Asset > Figure/Prop Assets... and in the Filtered Save dialog, navigate to where the product's wearables are. Paths may vary slightly but on my PC this would be: C:\Users\YourUsername\My Documents\DAZ 3D\Studio\My Library\People\Genesis\Clothing\Bot Genesis. Name the file something like rElbow_Asset.duf and hit Save. Now you get the Figure/Prop Assets save Options dialog. Asset Directory should be the one ending with My Library; Vendor Name:Parris, Product Name: Bot Genesis, Item Name: Bot Right Forearm. You should be able to leave other settings in this dialog as is. So if that all looks correct then hit Accept. What this will do is save out a new asset but also update the corresponding DSF (where the geometry info gets written) in the data folder. The DSF file that should get updated when you save in this case would be C:\Users\YourUsername\My Documents\DAZ 3D\Studio\My Library\data\Parris\Bot Genesis\Bot Right Forearm\Bot_Gen_rElbow.dsf. So after saving, you can delete rElbow_Asset.duf and rElbow_Asset.duf.png from the folder and just load the original wearable. for the left elbow do the same but take care to name the file you save as lElbow_Asset.duf and use Bot Left Forearm for the Item Name (case and spacing matters). But hey, if all that seems a little scary or too much of a pain, Just wait for the update. I uploaded it to QA today, so hopefully it will be available soon.